Lifehouse announce one Auckland show date on the back of their brand new album Out Of The Wasteland - which debuted at #1 on the US independent album charts (Billboard). 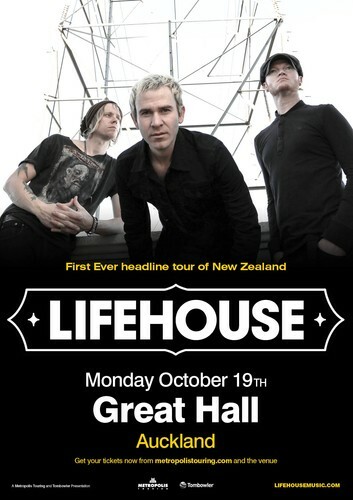 With over 15 million albums sold, American alternative rockers Lifehouse have been making waves all over the globe. From their debut single “Hanging by a Moment”, and with hits such as “You and Me”, “First Time”, “Broken”, “Halfway Gone” “Spin” and “Whatever it Takes”, Lifehouse have continued to astound audiences; and now for their first ever string of headline shows Lifehouse are coming to New Zealand in support of their recently released 8th album “Out of the Wasteland”. All signs point towards this being one of the tours that you cannot miss. Late in 2013, the band took a hiatus to focus on their own personal projects outside of Lifehouse. This time off gave the band a well-deserved refresh, and now they’re back with their strongest material yet. On the live front, the band is well known for putting on incredibly powerful and moving live shows. Fans all over the world are screaming out for Lifehouse headline tours, and this tour marks the first time since their appearance at 2002’s M-One Festival in Sydney Australia that the band will be playing beneath the Southern Cross. The band is seriously excited to finally make their way to New Zealand. For Lifehouse, Out Of The Wasteland is a culmination of their life’s work, a new chapter that serves as the pay-off for having the patience to reconnect with the musical and personal chemistry that took them to the top. Prepare yourselves for an emotional, powerful and energetic live show, one that will stay in your memories forever.